24"x30" mat, 1" squares on each side. 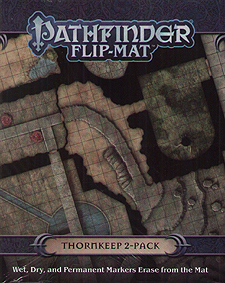 Delve the dungeons below Thornkeeps, the rough-and-tumble starting town of the Pathfinder Online MMO, with Pathfinder Flip-Mat: Thornkeep, a deluxe Flip-Mat 2-Pack featuring four complete dungeon levels designed by gaming superstars Jason Bulmahn, Ed Greenwood, James Jacobs, and Erik Mona! Use these maps with Pathfinder Online: Thornkeep to breathe added life into your Thornkeep campaign, or mix and match Flip-Mats to crate your own perilous dungeon adventures! Don't waster your time sketching when you could be playing. With Pathfinder Flip-Mat: Thornkeep, your adventurers can dive straight into a world of monsters, magic, and treasures!